I have one word for you today: FIGS. My friend Tracy grew them, on the tall, mittened fig tree in her backyard, the one tucked up against the kitchen window on the north wall. She transplanted the tree all the way from Brewster, despite the fact that everyone told her it would never make it, that it didn't have a chance so close to the water, that it would start to lose its leaves and then a few branches, and eventually, it would peter out and die. Instead, it flourished. It got so big that now it's taller than the window, taller even than the first story. It reaches up high, almost to the roof. 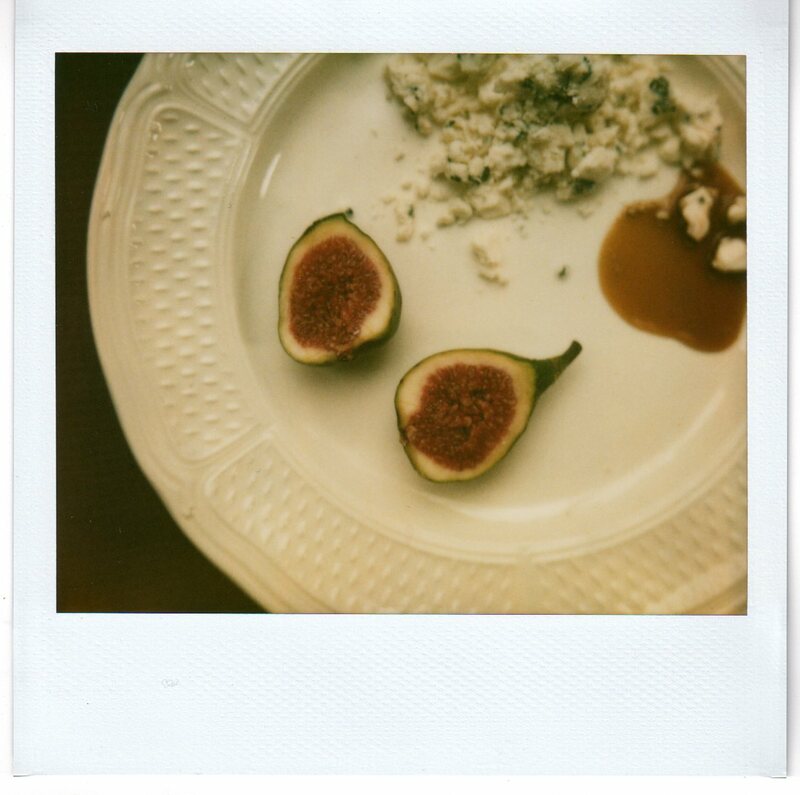 And every fall, around this time, it makes hundreds of figs—fresh, ripe, bursting, Wellfleet-grown fruit. When I play my cards right, I'm usually lucky enough to get a few. The other day, Tracy gave me four. I knew immediately how I wanted to eat them, what I wanted to do. I got out a bag of arugula from Lucas at Halcyon Farms, and tossed it with some red wine vinegar, olive oil, mustard, and a bit of salt. I sliced up an orange heirloom tomato, crumbled a round of goat cheese we picked up at a farm stand on our trip to Maine, and tossed both in. Then I sliced the figs in half, plated two salads, and gently laid them on top—two and two. We have our own fig tree coming along—potted, and still quite petite—but with a little nurturing and a sunny winter window, I'm hoping we'll be eating our own figs some fall soon. If you know someone who has a fig tree, you can take a cutting and it will root. Ours started out that way—as a tiny shoot with only one leaf, and now it has nine! (I know, still tiny.) If you don't know anyone with a mature tree and you're inspired to plant figs, I know Bayberry Gardens in Truro has a few. I am lucky enough to get to pick a tree clean every Monday. Mama, it's easy! All you need is a sunny window, and I know you have plenty of those. As for the arugula match, we were inspired by a salad we had once at Winslow's Tavern downtown—they stuff black mission figs with gorgonzola, roast them, and serve them on a bed of the greens. What a treat! Efrain, you are very lucky indeed. One day hopefully I will have the same priviledge...I am looking forward to homemade fig newtons.